It is an even 100 for United Launch Alliance – that is launches made into space. 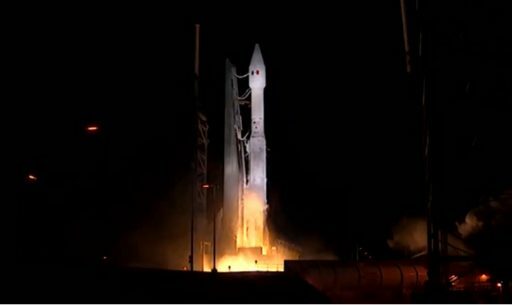 Friday saw the thundering liftoff of ULA’s Atlas V rocket, carrying into orbit the Morelos 3 satellite for operation by the Mexican government to provide data services across the country. 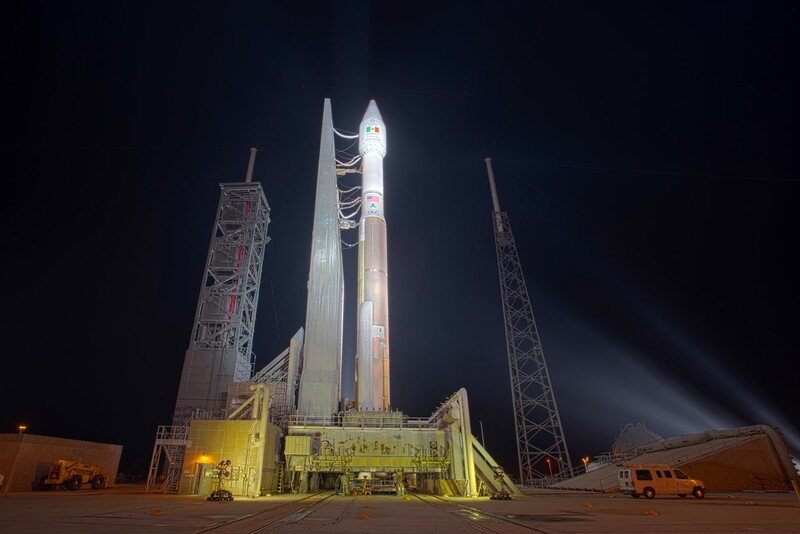 Completing a mission of two hours and 52 minutes after its 10:28 UTC blastoff, Atlas V achieved its sixth success of the year when the Morelos 3 satellite was sent on its way to start a mission of at least 15 years. United Launch Alliance can look back at nine years aiming for excellence in the business of launching all types of spacecraft – from satellites heading to a Low Earth Orbit to interplanetary science missions setting out to distant targets. 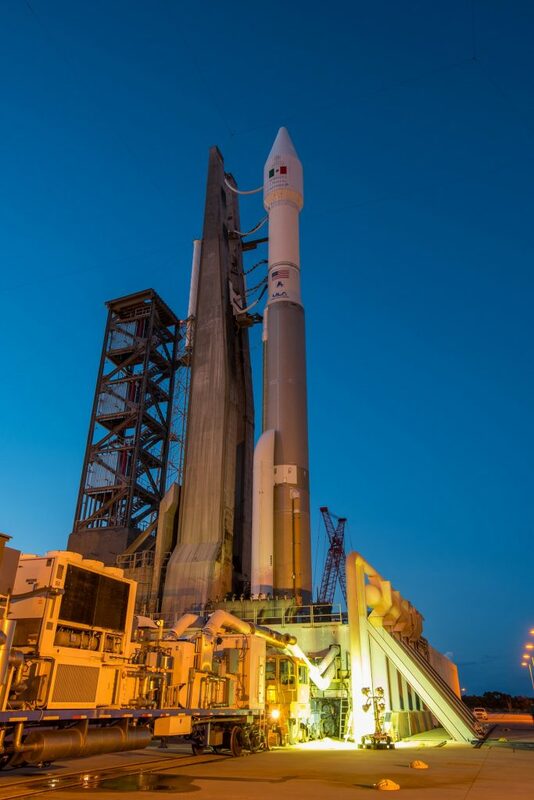 ULA supported on average one launch per month, totaling an estimated $80 billion of real estate delivered into space. Born in December 2006 out of a merger between aerospace giants Boeing and Lockheed Martin, ULA inherited the launch vehicle families of both parent companies – the Atlas V family that had been in operation since 2002, Delta IV also flying for the first time in 2002 and Delta II that has been in operation for 25 years and is now looking forward to retirement with only two flights remaining. 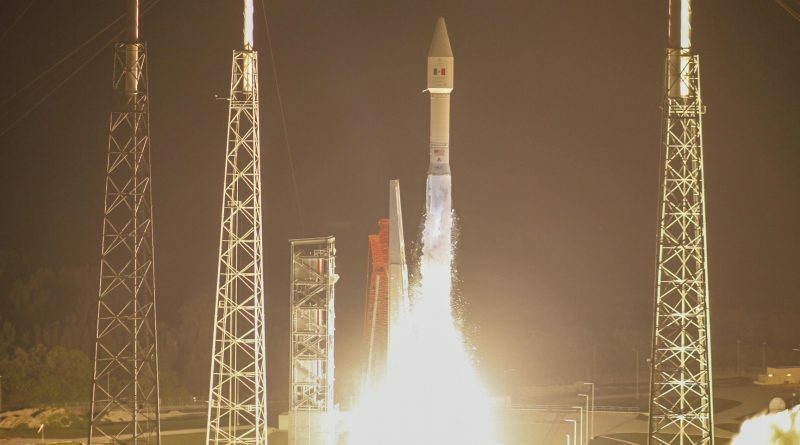 Missions flown by United Launch Alliance included NASA science missions to the Moon, Mars and Jupiter as well as flagship satellite programs operated by the United States such as the Global Positioning System, various military communications satellites and not to forget the classified National Reconnaissance Payloads that head into space without the public watching but are known to be the heaviest and most sophisticated spacecraft in operation. Maintaining an almost spotless record over its 100 missions, United Launch Alliance is known as one of the more expensive launch providers with rides on Atlas V eclipsing prices for a spot on the Ariane 5, Falcon 9 or Proton rockets. For that reason, ULA’s launch manifest is dominated by missions for the U.S. government with the occasional exception of commercially-contracted launches such as Friday’s Morelos 3 flight. Morelos 3, originally planned to fly on Proton, made the switch to the much costlier Atlas V likely due to the reliability concerns arising with Proton in recent times and the booked manifests of Falcon 9 and Ariane 5. 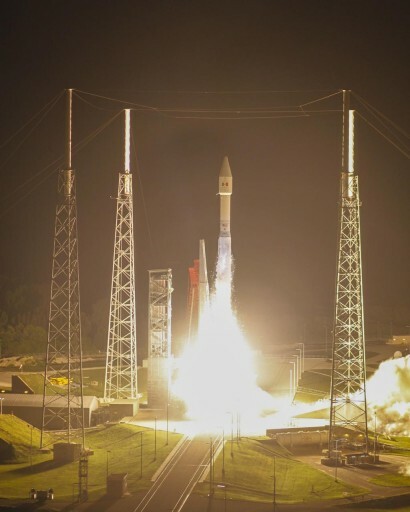 Given the loss of the satellite’s twin in a Proton launch failure in May, Morelos 3 was under some pressure to make it to orbit to establish an operational communications capability for Mexico and the Atlas V was the best bet for the vehicle achieving its mission objectives. Rolling to the pad in the afternoon, local time on Thursday, Atlas V used a shortened on-pad campaign that is being re-introduced to reduce the time the rocket spends on the pad – a technique used in the early life of Atlas V.
Heading into the countdown seven hours and 20 minutes prior to the opening of Friday’s launch window, Atlas V was powered up to undergo several hours of testing, exercising the various subsystems of the rocket to confirm everything was in readiness for the mission. At the pad, teams closed out all launch vehicle and ground systems for liftoff before evacuating the launch hazard area, signaling the GO to the launch team for the reconfiguration of the rocket for tanking. Fueling was initiated when the countdown resumed from the T-2-hour hold and was completed by the book as the Common Core Booster received 185,500 liters of supercold -183°C Liquid Oxygen in addition to the 94,600 liters of Kerosene fuel that had been loaded earlier. Centaur, the trusted upper stage, received 15,700 liters of oxidizer and 48,100 liters of -253°C Liquid Hydrogen. Fueling was completed with no issues as Atlas V stood proudly on its pad, awaiting the early morning liftoff time. Flying in its 421 configuration, Atlas V stood over 58 meters tall with a diameter of 3.81 meters and a launch mass of 428 metric tons, sporting the standard CCB – Centaur stack with two Aerojet-Rocketdyne Solid Rocket Motors attached to the first stage and the long version of the vehicle’s four-meter fairing installed on Centaur. Each of the twin boosters is 20 meters tall, 1.58 meters in diameter and loaded with 40,960 Kilograms of propellant to deliver 1,688kN of thrust over the initial flight phase, assisting the Common Core Booster. The CCB itself is 32.46 meters tall holding 284,089 Kilograms of propellant to be consumed by the two-chamber RD-180 engine that generates 4,152 Kilonewtons of vacuum thrust. Sitting atop the CCB, the Centaur upper stage, was flown with the 106kN RL-10C engine on Friday, making its 6th launch. Centaur is 12.68 meters in length and 3.05 meters in diameter with a propellant load of 20,830 Kilograms. Heading into the last hour of the countdown, Atlas V repeated tests of its Flight Termination System, received an updated version of the flight software computed for this launch and readied the pneumatic and hydraulic systems on both stages. The RD-180 engine completed its fuel fill sequence while the RL-10C on Centaur continued chilldown and tanks were topped up at flight level. In the meantime, Morelos 3 finished its transfer to internal power to be ready for its ride into orbit. A unanimous GO decision to press into the Automated Countdown Sequence was reached by the launch team, clearing the way for liftoff at the 10:08 UTC window open time. Going through the automated countdown, Atlas V pressurized its tanks, armed all pyrotechnics, transitioned to onboard power and control, and readied its flight controls for liftoff. But before getting to engine ignition, the countdown was held by range controllers because a boat had gone astray and entered the Falling Debris Zone in the off-shore waters of the space coast. The countdown abort was followed by busy work by the launch team to recycle the rocket in time for one more shot at launching within the 20-minute launch window. While the boat was instructed to move out of the area, controllers were re-polled to confirm a good recycle and readiness to head into the automatic countdown a second time. Picking up the count at 10:24 UTC, clocks went all the way down to T-2.7 seconds when the ignition of the RD-180 engine was commanded and the massive two-chamber engine began soaring up to a liftoff thrust of 390 metric-ton-force. The powerplant was monitored for a short moment before committing the rocket to flight by igniting the twin AJ60 boosters. 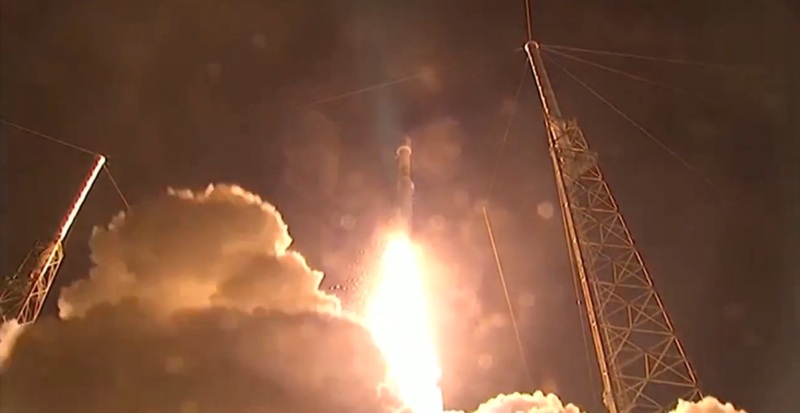 Atlas V jumped off its pad at 10:28:00 UTC, the closing second of the day’s launch window. 734,700-Kilogram-force of thrust were carefully balanced to keep the vehicle ascending upright for the first six seconds of the flight before Atlas V pitched over and rolled onto its course, departing Florida to the south-east along a 104° launch azimuth. Burning two metric tons of propellant per second, Atlas V began heading downrange, passing Mach 1 after just 47 seconds and encountering Maximum Dynamic Pressure at the T+1-minute mark. The twin boosters burned out 94 seconds into the mission and were jettisoned at T+2:07 to ensure an off-shore impact of the empty booster shells. With the boosters gone, Atlas V switched to the Zero-Angle of Attack flight phase, using a pre-programmed attitude control profile optimized for the current atmospheric conditions. 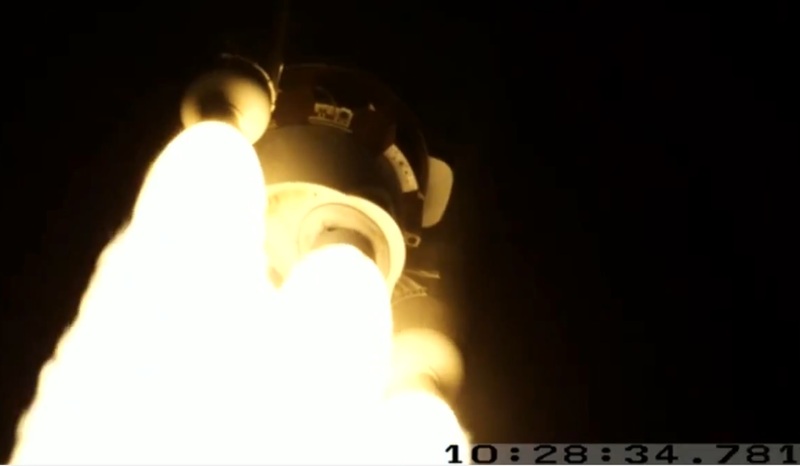 Thrust on the RD-180 increased to 422,400 Kilogram-force as Atlas V reached the rarefied upper atmosphere, injecting 1,150 Kilograms of LOX and Kerosene into the engine every second of the flight. The vehicle showed rock-solid performance when making the switch to Closed Loop Control, beginning to dynamically adjust its flight path to meet its cutoff targets. After a gradual reduction of thrust on the main engine not to overstress the vehicle, RD-180 shut down as planned four minutes and ten seconds into the flight. 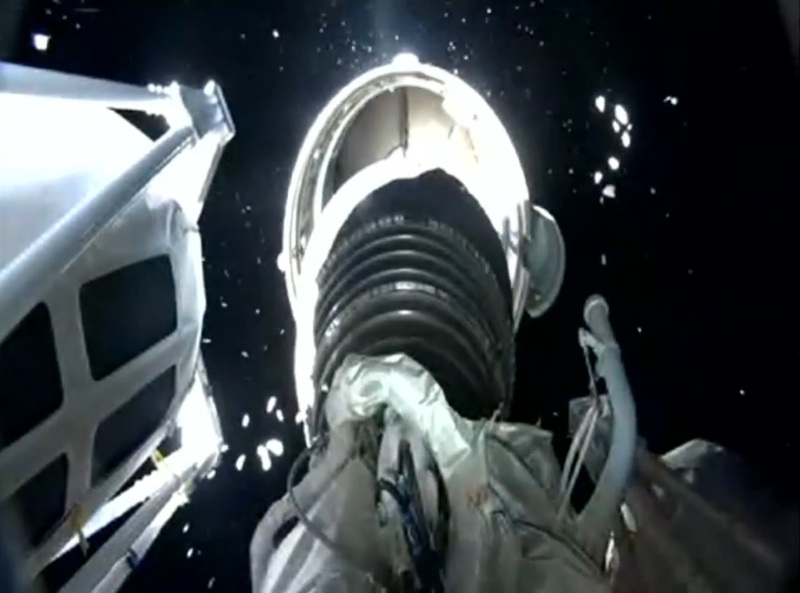 BECO was followed by the pyrotechnic separation of the stages, sending the Common Core Booster on its way to re-entry using eight retrorockets. Centaur’s RL-10C engine came to life four and a half minutes into the mission on what was a planned 13-minute and 44-second burn to boost the stack into an elliptical parking orbit. Continuing to stick to the predicted trajectory, Centaur delivered 10,800 Kilogram-force of thrust, heading across the Atlantic. 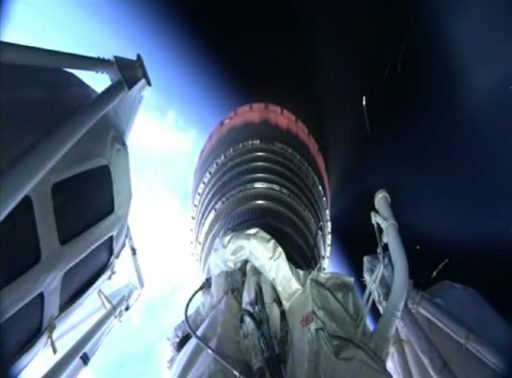 Main Engine Cutoff was confirmed a little over 18 minutes into the flight and the stack was shown in an orbit of 181.5 by 31,725 Kilometers at an inclination of 29.97°. Coasting for the next two and a half hours allowed Centaur to climb to a position where a propulsive impulse would raise the perigee and apogee almost by equal amounts. Re-start of Centaur occurred two hours and 48 minutes after launch as RL-10C fired for just 51 seconds, aiming for an insertion orbit of 4,738 by 35,786 Kilometers, also slightly reducing the inclination from 30 to 27°. After shutdown, Centaur’s navigation platform showed and orbit of 4,796 by 35,789 Kilometers at 26.99° – marking an on-target orbital insertion. Morelos 3 was sent on its way at 13:20 UTC, entering its planned orbit for a multi-day transfer to Geostationary Orbit to take up station over Mexico to deliver communications services with a payload of Ku- and L-Band transponders. The L-Band system delivers 122 spot beams of coverage to mobile terminals in the Mexican territory as well as the Gulf of Mexico and Pacific Ocean. The Ku-Band payload will be used for high-data rate communications including voice, video and secure data links. Friday’s launch was the 639th of a vehicle named Atlas since the program’s beginnings in 1957, it was the 57th Atlas V to launch, the 5th to fly in the 421 configuration and the sixth Atlas V launch of 2015. The next Atlas is already topped by its payload, the classified NROL-55 for the National Reconnaissance Office, to become ULA mission 101 next week aiming for liftoff from Vandenberg Air Force Base on October 8. The next Atlas V to fly from Cape Canaveral is currently scheduled for liftoff before the end of the month with the next GPS satellite.